Make sure you have consent from users to receive notifications. It is best practice, and also potentially required by law in certain jurisdictions, for you to have consent from your end users before sending messages to them, and you should respect your end users' choice to not receive messages from you. It is also important to make sure your database is up to date. This is particularly important for number-based communications like SMS because over time phone numbers may be reassigned to different individuals. If your database is out of date, you could inadvertently send a message to someone who did not consent but was reassigned a phone number that was previously subscribed to your service by another person. Check out the Twilio Marketplace for Add-ons from our partners that can help you keep your database up to date. 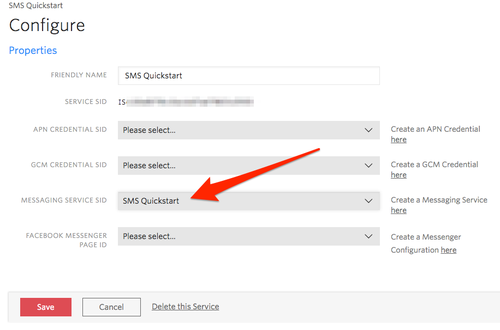 The first thing you need in order to send an SMS notification is a Twilio-powered phone number. You can grab one to use in the console here by going to the Numbers tab to add a phone number. Make sure that it has SMS enabled! This step is optional. If you do not want to store the phone numbers' of your users in Notify to manage all contact information in one place, you can just skip ahead to Send an SMS Notification. User Identity - this is a unique identifier of the user. In this example its 00000001, but its up to you, how you identify your users. Only requirement - it has to be unique and not Personally Identifiable Information. Notify uses Identity as a unique identifier of a user. You should not use directly identifying information (aka personally identifiable information or PII) like a person's name, home address, email or phone number, as Identity because the systems that will process this attribute assume it is not directly identifying information. In this step, we will send an SMS. If you created a Binding in the previous step we are going to use that if not you can just provide the phone number(s) you want to message directly in the request. Or alternatively, you can just provide the phone number directly. If you want to send an SMS to multiple phone numbers, just add more ToBinding parameters. Or learn how to send Notifications to a group of users.